SETA BioMedicals commercializes fluorescent products for a broad range of applications in the biomedical, pharmaceutical, and environmental research fields. These products are fluorescent detection reagents for biomedical applications - dyes, probes and labels, fluorescent proteins and conjugates. Our Search Products tool will help you to find a product by type, specific application or spectral characteristics. Square , Seta , and SeTau dyes are a series of dyes that span the whole visible spectrum and the NIR. They are available with various functionalities: carboxylic acids , as amine-reactive NHS esters for labeling of amino groups on peptides, proteins or amino-modified DNA, as maleimides for coupling to thiol-groups in proteins and thiol-modified oligos and as amino-modified labels (on request). With a few exceptions all these reagents are available in either 0.5 mg, 1 mg or 5 mg Pack Sizes. Please do inquire about the availability of bulk quantities. Among all these functionalities N-hydroxysuccinimide (NHS) esters are the preferred reactive functionality for labeling of amino-groups due to the formation of highly stable amide bonds with amines. Sulfonyl chlorides also form stable sulfamide bonds but the reaction also generates HCl, which is a not so desirable by-product. In addition sulfonyl chlorides are more difficult to synthesize. Maleimides are the preferred functionality for labeling of small molecules such as peptide and oligo-nucleotides. Maleimides form bonds with thiols at relatively mild conditions and with reasonable yields. Maleimides are less susceptible to hydrolysis in comparison with NHS esters. We would like to refer you to our labeling procedures for specific guidance on how to label with NHS-esters or maleimides. Several of our most sensitive Seta Dyes and some of our lifetime and 2P imaging dyes are also available as azides to be reacted with C≡C-triple bonds in either a Cu(I)- catalized 1,3-dipolar cycloaddition reaction to a triazole (see figure) or as cyclo-octynes for strain-mediated cyclization reactions without the need for a Cu-catalyst. The metal-free reactions have a wider applicability and are compatible with cell-based applications. The Seta reactive dye series spans the whole visible range and the NIR. These bright and photostable fluorescent labels were selected to cover most of the important wavelengths that are available from common laser sources. Our newly introduced fluorescent labels Seta-375-NHS and Seta-385-NHS and the popular, blue-diode laser excitable Seta-405-NHS (Pacific BlueTM) are directed for use with the UV and blue diode laser sources. They combine high quantum yields and photostability and are suitable for STED microscopy. Seta-470-NHS , and Seta-470-maleimide are highly sensitive viscosity labels with either fluorescence intensity or fluorescence lifetime as the read out parameter (see also product flyer). 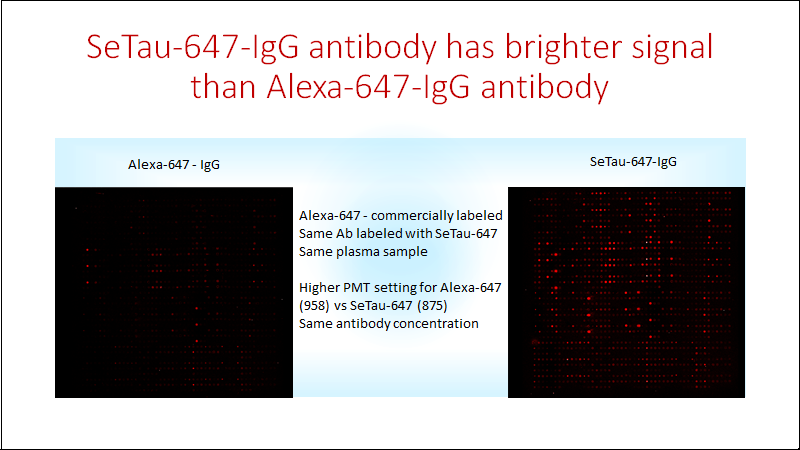 Seta 680-NHS , Seta-700-NHS , Seta-750-NHS and Seta-780-NHS are fluorescent labeling reagents that provide a flexible solution for NIR labeling of proteins, peptides or antibodies. 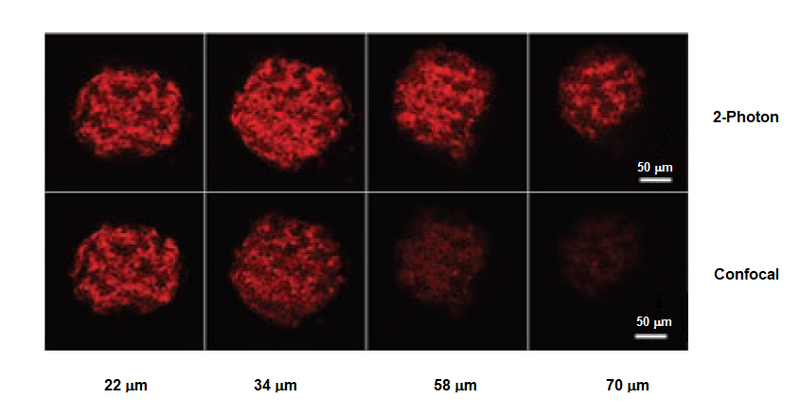 These labeling reagents are ideal for in vivo optical imaging and fully compatible with the KODAK In-Vivo Multispectral Imaging System FX, the IVIS Imaging System (Caliper LifeSciences) or the Odyssey Fc Imaging System (Li-COR). The lifetime-sensitive Seta labels Seta-633-NHS or Seta-670-NHS exhibit shorter fluorescence lifetimes (FLTs) in aqueous media or when labeled to low molecular weight analytes (drugs or small ligands) but increased brightness and up to ten-times longer FLTs when bound to proteins or oligonucleotides and are unique tracers for FLT-based assays. All of these environment-sensitive FLT labels are excitable with a 633, 635 or 647 nm laser source and Square-660 and Seta-670 can also be excited with a 405 nm laser. The long-wavelength squaraine-rotaxane series is a new, next generation class of dyes that combines high quantum yields (up to 60%) and high extinction coefficients in the order of 150,000 – 200,000 M –1 cm –1 . These dyes were developed by SETA BioMedicals in order to overcome some of the shortcomings of conventional dyes such as low brightness in aquous solutions, low stability against oxygen species and low photostability. Squaraine rotaxanes are available in reactive, water-soluble formats as carboxy, NHS ester and maleimides but also as hydrophobic probes for imaging applications. More importantly, these rotaxanes are currently considered the best 2P probes and labels on the market combining high sensitivity and extremely high 2PA cross-sections of up to 10,000 GM! 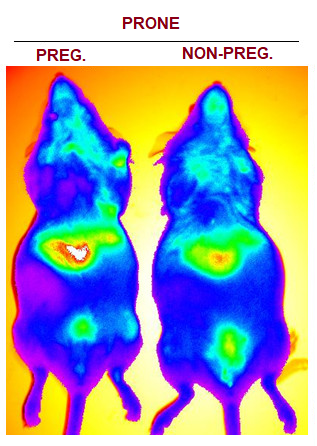 They also have excellent properties as fluorescent detection reagents for DNA and protein microarrays. The SeTau lifetime labels have lifetimes in the range between 32 and 9 ns. These dyes are excitable in the UV or blue region and are also useful as polarization probes for the measurement of high MW analytes (small proteins). SeTau-425-NHS for example was used to measure a high molecular-weight analyte such as BSA directly in an FP assay. Importantly the FLTs of these labels do not change upon labeling or binding to proteins or analytes as they are not environment sensitive. The Square dyes are more hydrophobic in nature and thus they exhibit a strong environment sensitive behavior and are therefore very suitable to trace binding between a labeled, low-molecular-weight analyte and a larger biomolecules. These dyes are suitable for use with either intensity or lifetime as the read out mode. More detailed information about specific probes and labels in this series e.g. Square-655 (protein-sensitive fluorescent probe), Square-650-pH-NHS (pH-sensitive label), Square-670-Carboxy (fluorescent probe), and Square-660-NHS or Square-680-NHS (lifetime-sensitive fluorescent labels) are provided in the Applications Section. The water-soluble Zy dye NHS esters and maleimides are structurally identical with the reactive CyTM dyes (Cy3, Cy5, Cy5.5 and Cy7) of GE Healthcare and are sold at very competitive prices! Please contact us for price quotations on other derivatives or bulk orders. YOSeta-1 is a cell-impermeant fluorescent dye used for staining of double-stranded DNA (same dye as YOYO1). The unbound YOSeta-1 dye has a very low fluorescence quantum yield but the QY increases several thousand times upon binding to double-stranded DNA (see specs sheet ). The probe is available as a 1 mM solution in DMSO. Other probes are suitable for the measurement of changes in lipid bilayer hydration of cells, measurement of cholesterol in biological fluids, or are used for proteins analysis . Square probes are probably one of the most sensitive dyes for the quantitative analysis of proteins. 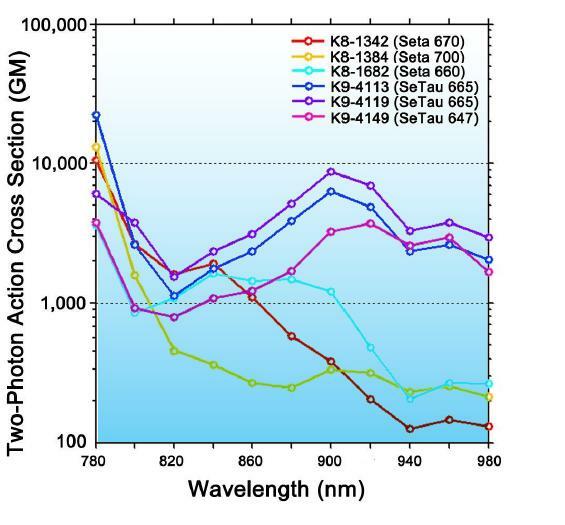 Our new type of extremely photostable and bright squaraine rotaxane probes for cellular imaging are based on the long-wavelength SeTau dye series. The pH-sensitive probe Square-650-pH is the only probe of its kind which shows lifetime sensitive responses in the physiological pH range. Our pH-sensitive dyes with a pKa in the alkaline pH range are also available in reactive form for labeling to carrier molecules. Phycobiliproteins hold the record for the largest number of photons emitted before bleaching – they are one of the most sensitive fluorescent reporters known. 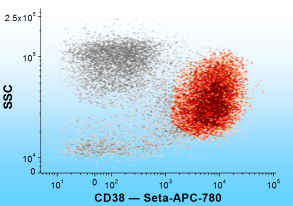 SETA BioMedicals offers lyophilized versions including new, bright and highly photostable tandems of APC and PE with Seta dyes for use in flow cytometry and other immuofluorescence applications: Seta-APC-705, Seta-APC-780, Seta-PE-670, Seta-PE-775 and Seta-PerCP-680. Fluorescence lifetime (FLT) standards are used to calibrate or test the performance of time- and frequency-domain instrumentation for luminescence lifetime measurements while fluorescence polarization (FP) standards help to calibrate or test fluorescence instrumentation for polarization measurements. Please visit the relevant links for more information. The extremely bright fluorescent classification dyes for encoding of microspheres (beads) are used in High-Throughput Screening (HTS) and Multiplexed Analysis Systems. Non-fluorescent quencher molecules for FRET applications , both reactive and non-reactive versions are also available.